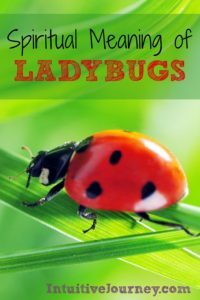 Ladybugs have always had a special meaning to those that work with soil in growing plants. Said to be good luck for farmers and gardeners, the legend was built on this beetle’s ability to feast on pests of plants. However, this is a valid point to remember, among other natural and spiritual world amazements. Ladybugs may be tiny, but are hard to ignore when they fly within your sight. Not only do they symbolize good luck, they bring a twinge of joy and playfullness with their beauty and whimsical nature. One minute they may be crawling peacefully along a twig and the next, taking to flight with an eager balanced move. Their color is appealing to the eye and they bring about a feeling of trust, abundance, knowledge and protection. Those of the animal totem of the ladybug are said to be inquisitive and naturally highly spiritual. Ladybugs share the same complete transformation as the butterfly although this life cycle often goes unnoticed. The larvae forms on tiny leaves and has legs to crawl to a more desireable position. They molt 4 times in their transition, patiently waiting on each phase to be completed. This life cycle is significant when compared to the spiritual journey that one takes in finding complete spiritual acceptance. Some people believe that numerology offers meaning to a life’s path. Those looking to the spiritual realm also find meaning to these numbers. Ladybugs have anywhere from one to seven spots. More than likely, these dots represent the point of transformation that this little beetle is at. The same could be applied to your own life as a reminder of how much further your spiritual journey has to go. The most important gift that the ladybug has to offer is its spirit in bringing us closer to our intuition and our ability to open up to receive the gifts of the cosmos. If you are ever curious as to the power of a ladybug, watch the reaction of a child as they encounter this curious beetle. Their joyful response will show you the answer in what you need to achieve in your life’s journey.